Hello again! 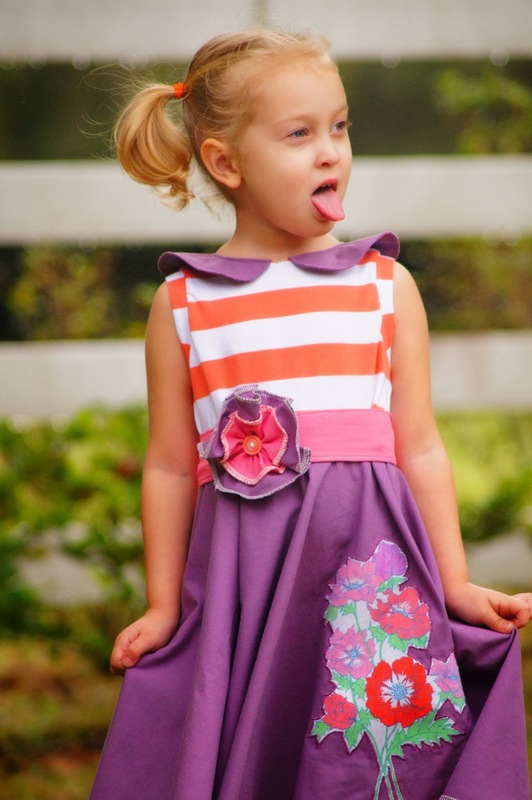 This is Harmony from 3Giraffes back to show you how to make the fabulous Endless Dress using knit for the bodice! I'd like to start off with a couple notes and disclaimers. 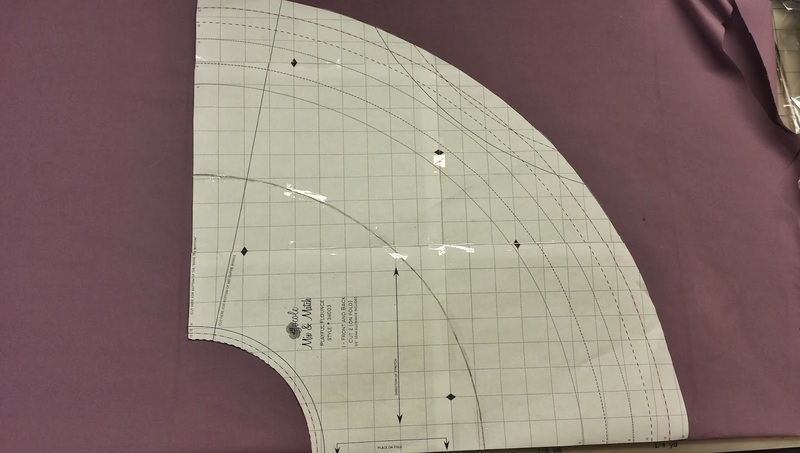 Some notes: I would highly suggest making the pattern as the base pattern first so you get a feel for the fit of it on your child as well as the steps for putting together the collar. 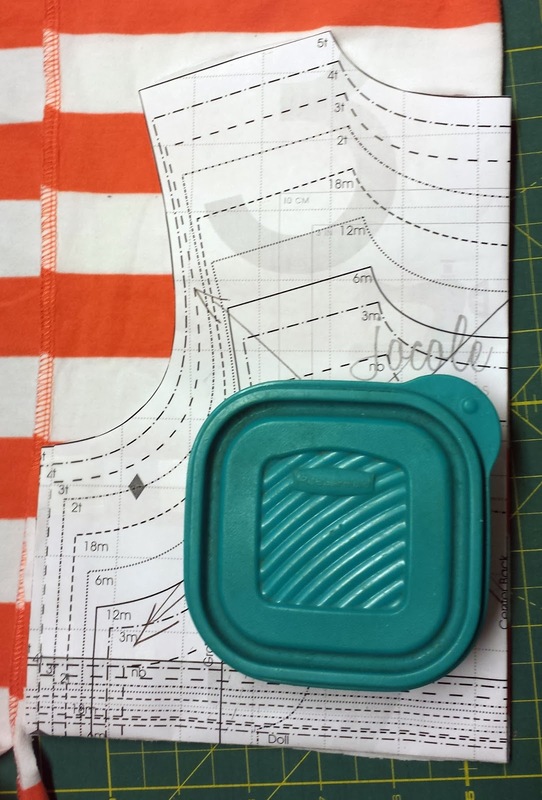 I would also suggest that regardless of the fit of the dress using wovens (like for the base dress) you size down the bodice at least one size - more if you have a skinny child. This is because knits are made to stretch. They love to do it! And you don't want the dress to look large and sloppy because you are using a knit instead of a woven. That being said, always make sure you measure twice so you cut once! Last note - I used the Playful Flounce Bottom skirting from the Mix and Match series. There are LOTS of pictures! Please be patient if it takes a minute to load because of that. I re-purposed an adult t-shirt to make the bodice of this dress, but you can absolutely use by the yard knit (Just letting you know since it means the knit looks funny in the pictures.). SO! Let's get started!! Since I had already made the dress using wovens for my daughter I knew that I needed to size down to a 4T width but keep the 5T length for her with wovens. I did not size down more than this using the knit bodice - hence my above note to size down more because knits like to stretch. Lesson learned! Next time I will size down to a 3T width and keep the 5T length for my skinny child when using knit. I used a container of pins as a weight to hold the pattern down instead of pinning it. 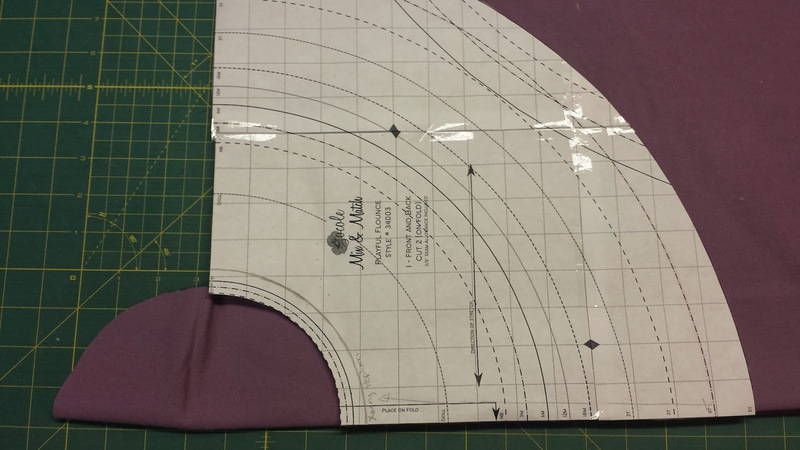 There is a line down the center of the back bodice piece to mark the actual center back. Fold along this line. 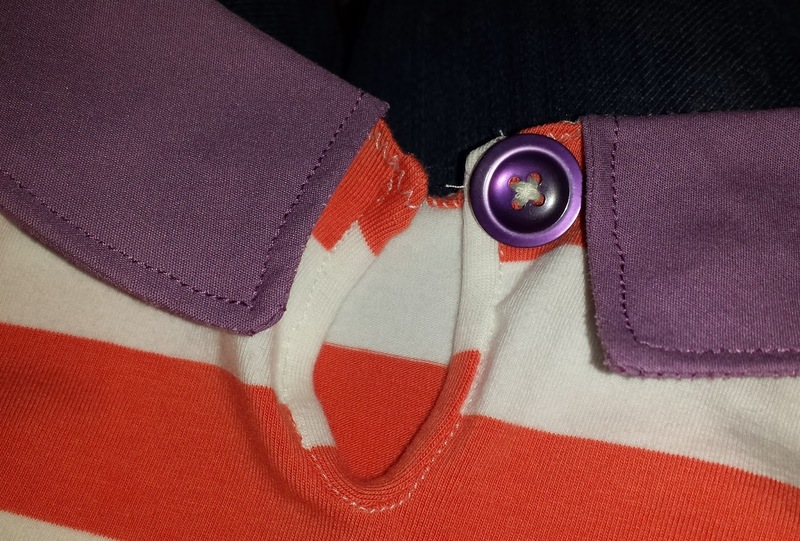 You do NOT want to make the back extra wide to accommodate using buttons all down the back. 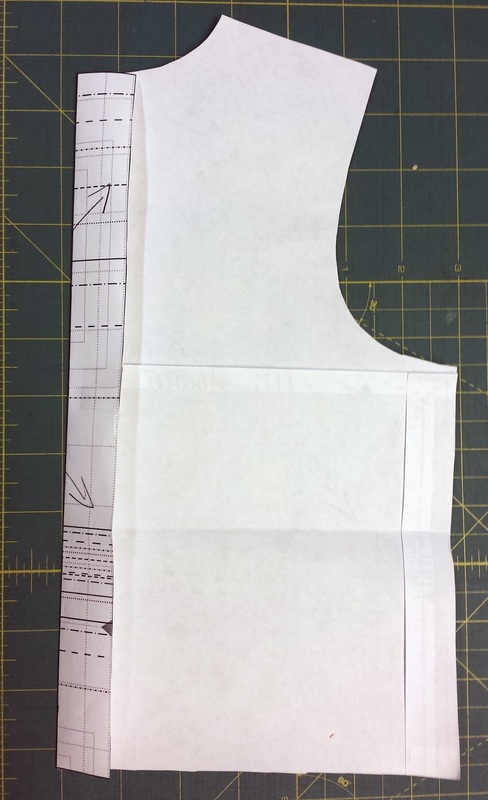 Put the now folded edge of the back bodice piece along the fold of your fabric and cut out. Once again doing the sized down width and keeping the length you want. Since I wanted to do no sleeves I needed to then trim excess off of the shoulders at the arm holes since I would be doing a band around the arm holes. 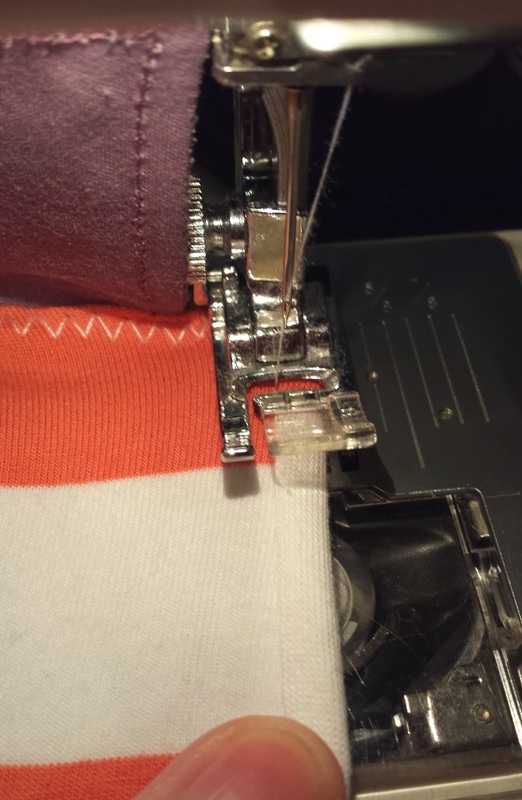 If you are wanting to do any kind of a sleeve then do NOT trim away the excess. I trimmed away about 1/2" at the top and tapered down until it lined up about 3/4 of the way down the arm hole. 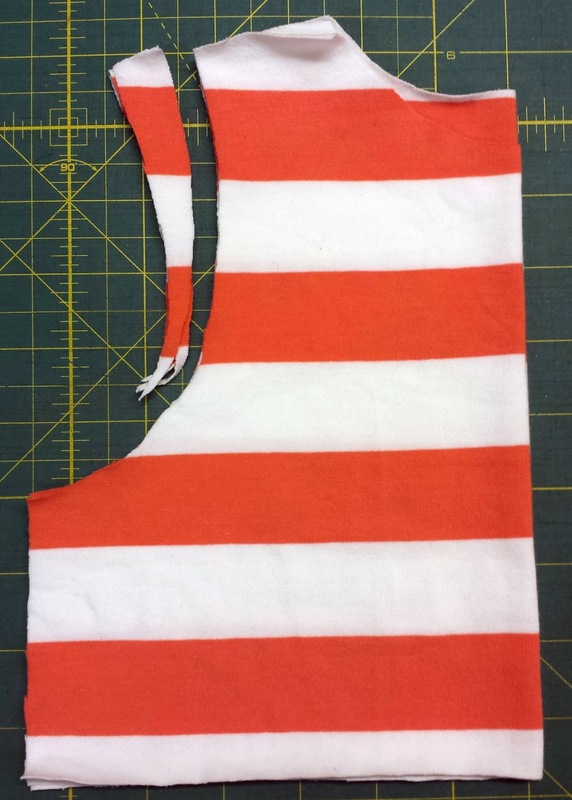 It's hard to see in the picture since I lined up the stripes, but I have the front bodice laying on top of the back bodice and did them both at once to make sure I cut away the same amount from each. Because this dress will have a collar made out of the same woven material I used for the skirt the back needs to open up to allow the head to fit through. Measure down the center back. For the size of my daughter (she's a very skinny 5/6) I measured 3inches down. For babies and toddlers I would likely measure 2-2.5 inches down. Preschoolers to about 7 years old 3-3.5 inches down. 8 years old and up would be about 3.5-4 inches down. Once you figure out how far down you should make the opening, cut down the center back. - Again, I cut 3 inches down. Now it's time to cut out the skirt part of the dress. I measured from the top of my daughter's shoulder down to where I wanted the dress to end (just below her knees). I don't have a picture of this or the next couple steps since I took all the pictures after she went to bed. Sorry! BUT I can walk you through it. Once you know how long you want the dress to be from shoulder to hem you subtract the length of the bodice piece you've made. 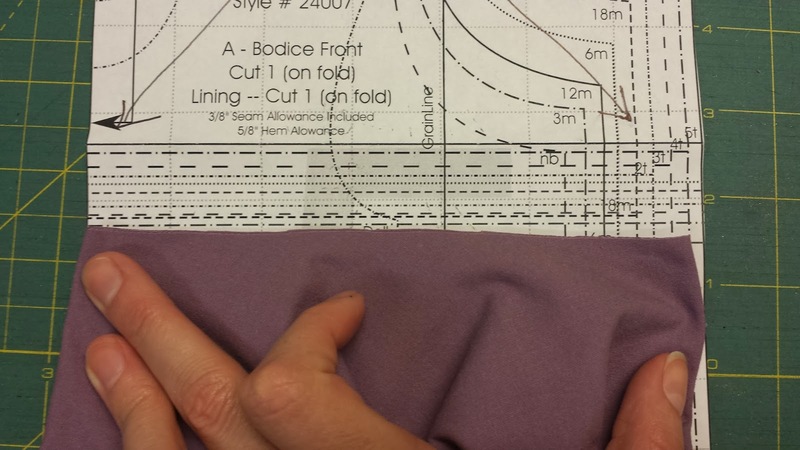 Add seam allowance to that number and it tells you how long you need to make the skirt. I used the size 14 Mix and Match series Playful Flounce Bottom and added a couple inches to the bottom all the way around. 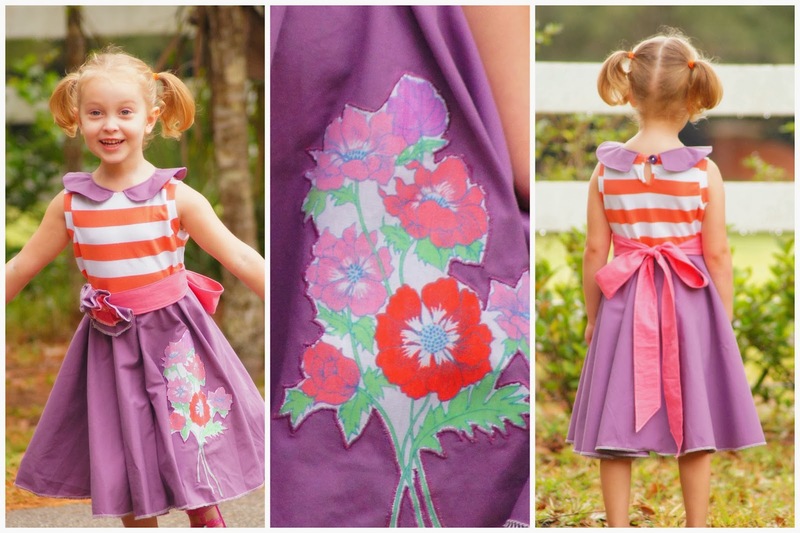 You could also use the skirting from the Circle Flounce Dress. 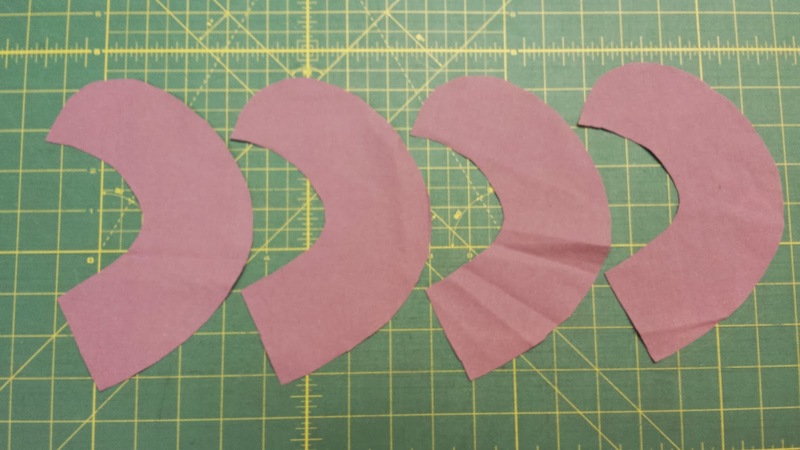 You can either cut the skirt as two pieces and sew the sides together, or fold the fabric in half and then half again to make a circle with no seams, or fold the fabric in half and move the pattern after you've cut half out like I did. Cut out half of the skirt on the fold adding the couple inches around the bottom that I needed, but not cutting out the center circle yet. 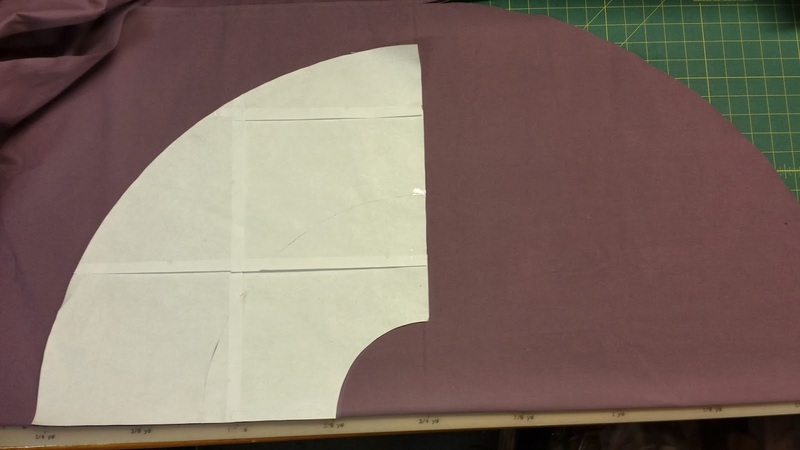 Flip the pattern piece over, keeping the center lined up and keep cutting around the other side to make one bit circle. No side seams. Yay! I then folded the cut out skirt in half again so that it looked like 1/4 of a skirt. I took a much smaller sized skirt pattern and laid it on top lining up the straight edges and cut out the center of the skirt. 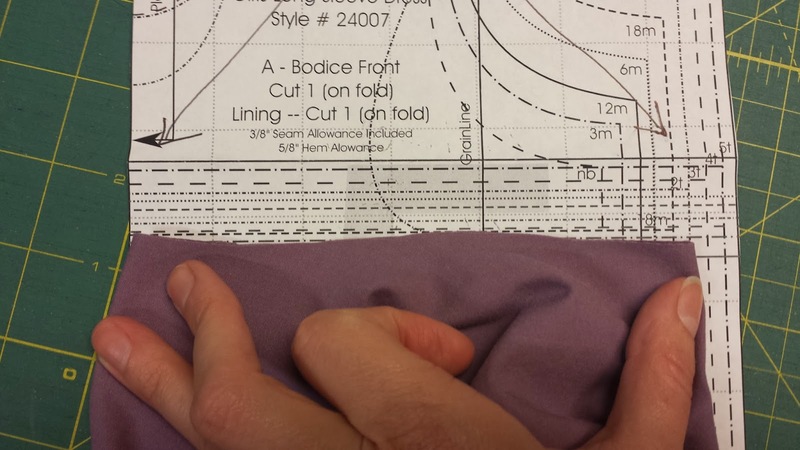 I then measured the center opening against the endless dress bodice pattern to check for sizing. Keep the skirt folded into the quarter skirt for this part. Because my center opening wasn't big enough I had to trim away some fabric from it. ***IMPORTANT*** Only trim away 1/8" width at a time!!! You can always trim away another 1/8" width, and another, and another until it's perfect, but if you trim away too much it will be a huge opening! You have to keep in mind that it's 1/8" width all the way around a circle. Which means it's much more than 1/8" width when it's all said and done. I ended up trimming away 1/8" twice (for a total of trimming away 1/4"). 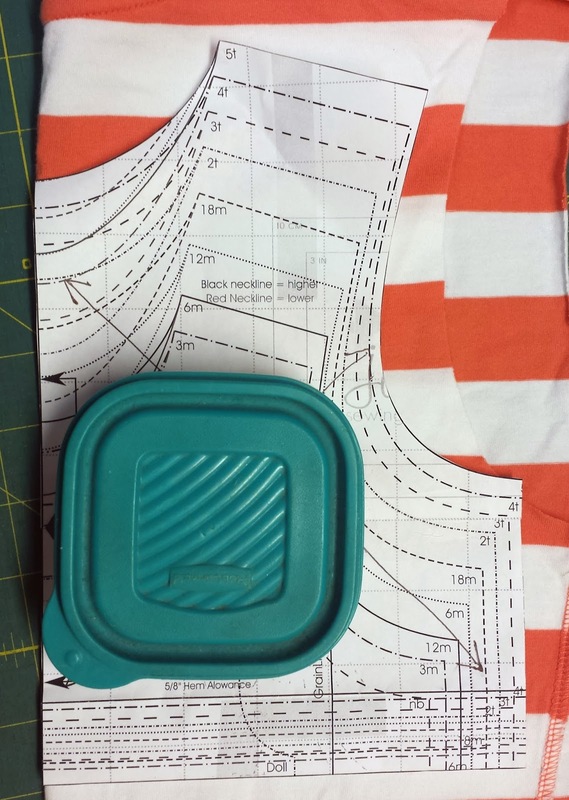 Then my inside opening was the right size when measured against my pattern. 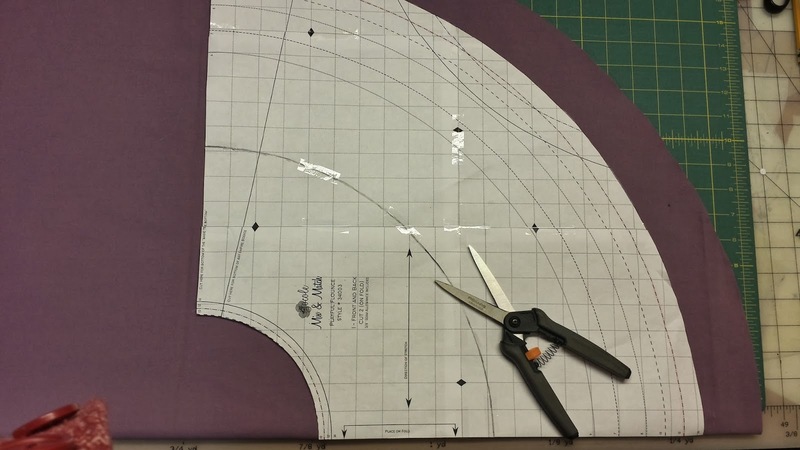 Follow the instructions for making the collar. 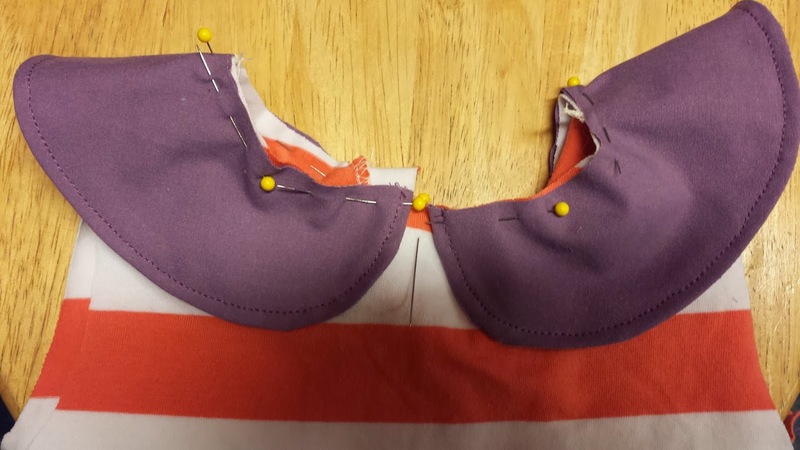 Sew the shoulder seams of the bodice front and back together. 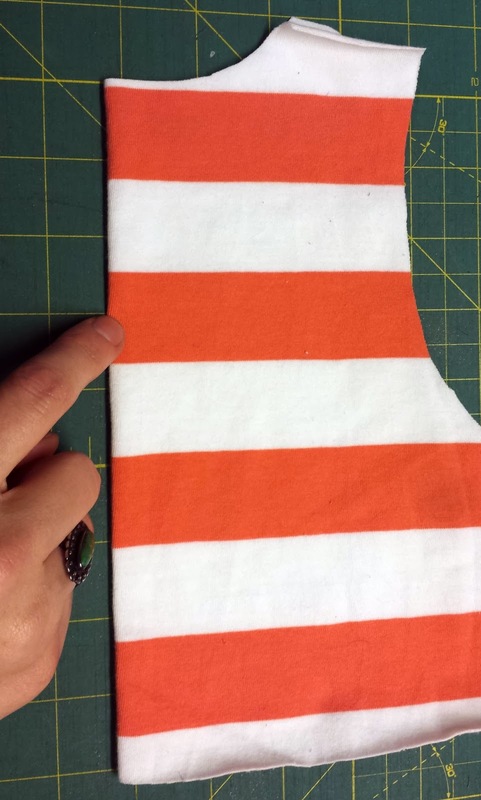 Cut out two strips for binding the arm holes and a strip of knit for binding the back slit that is your seam allowance x 3 in width and about 4.75" in length if you did the 3" opening. (If you did the shorter opening you don't need that long, if you did a longer opening then you need longer.) 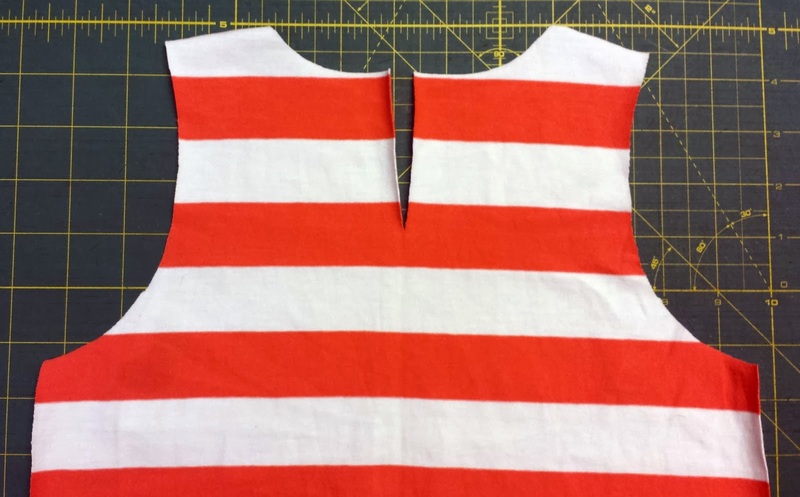 Sew the strip of fabric to the slit in the back of the bodice with the right sides of the knit facing each other. 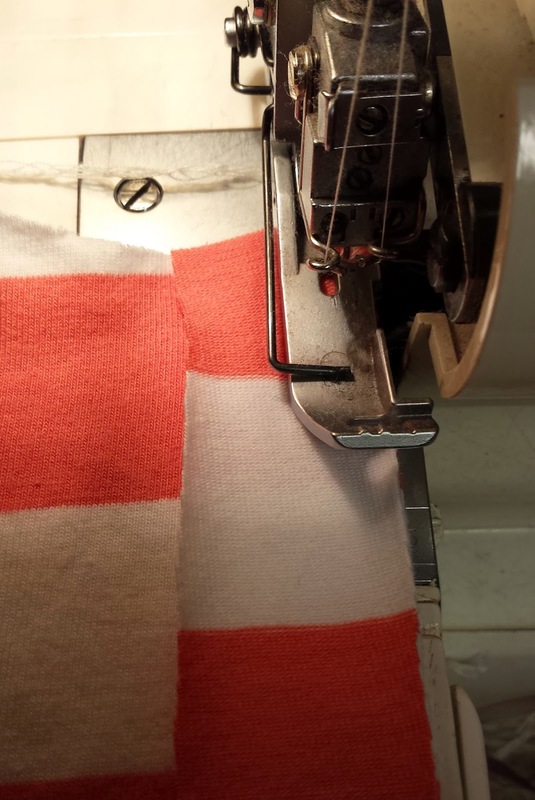 Make sure the binding strip is stretched as you sew. I couldn't get a good picture of what to do when you get to the bottom of the slit. (I tried! I swear!) 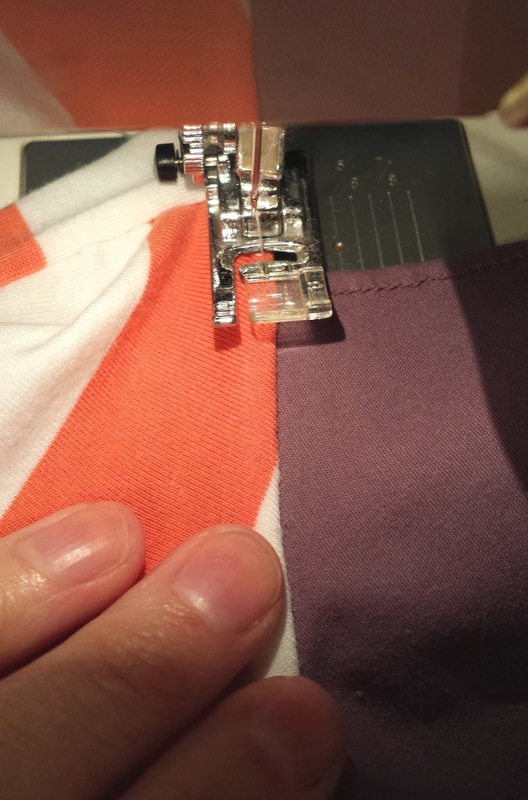 Basically you just lay the piece open and pretend like it's any other straight line you are sewing. It will seem wrong while you are doing it and look strange when it is done, but I promise it will look good when all the steps are completed! Please note: I didn't measure a specific length, I just did it. Which is why it is hanging over. See what I mean? This looks a little strange. All I've done at this point is sew the binding strip on. I have not yet folded it over and top stitched it. Leave it like this for now or you can fold it under and top stitch it now - it doesn't really matter. 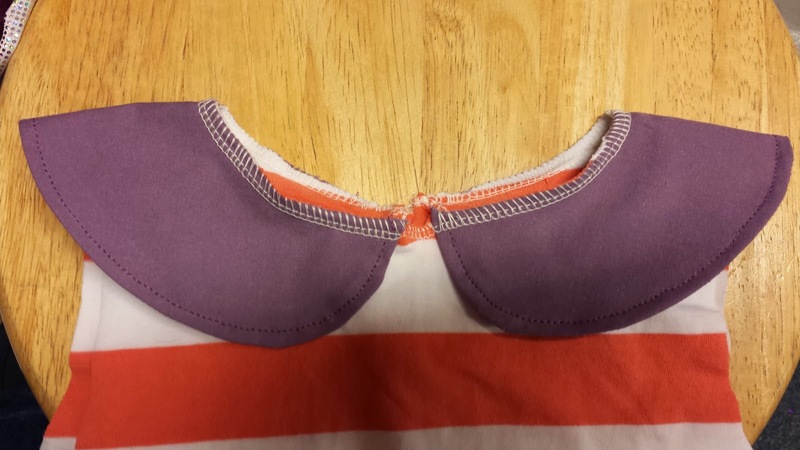 I chose to sew the collar on before top stitching this part. Pin the collar in place and sew on. Again, it's looking strange but it will look pretty in the end, I promise! Next sew on the arm binding around the arm holes, OR sew on the sleeves. Whichever look you are going for! I chose to do binding that would be about 1" wide after it was sewn on. After the arm holes are finished off with either binding or a sleeve, fold the seam where the collar is down and have the collar flipped up so you can sew the seam down along underneath the collar. I used a zig-zag stitch for this part, but that's only because I've broken my last twin needle and didn't feel like doing this top stitching twice - otherwise I would have done a double top stitch! 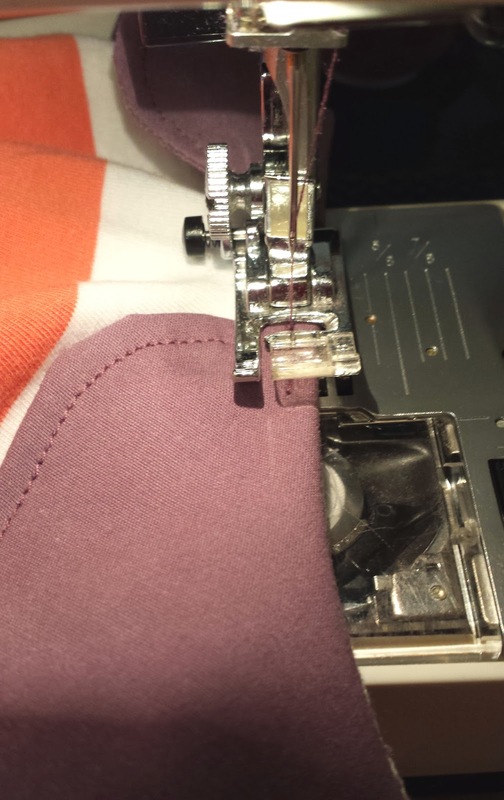 ***IMPORTANT*** Make sure you also have the same amount of seam allowance sewn down along the top of the binding for the back opening. I didn't think to take a picture of this part when I was doing it. Sometimes I get caught up in the actual MAKING of an item I forget I need super details for pictures for a tutorial. After the seam is sewn down under the collar it is time to fold under the seam binding along the slit in the back. I left the seam going outwards towards the center of the slit and folded the binding fabric over top of the seam, then underneath the seam on the back side, covering up the seam entirely. 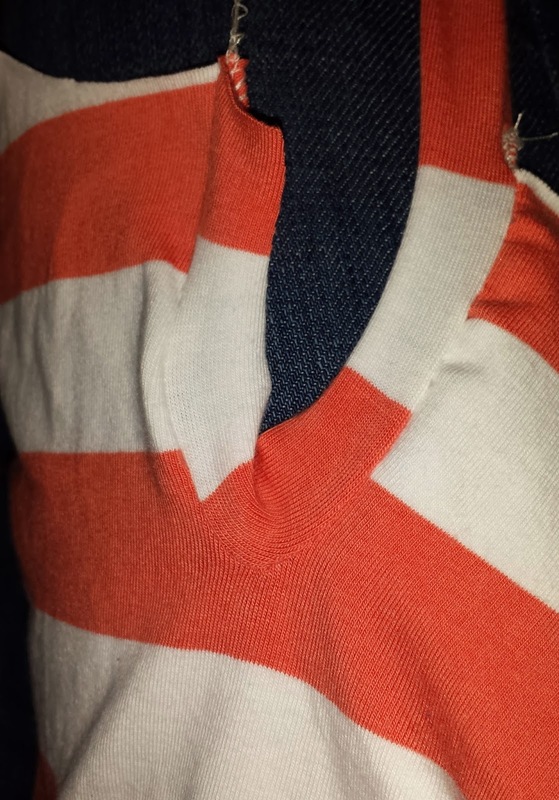 Then do a straight stitch right in the seam where the two fabrics meet. This is called a stitch in the ditch. - for more detailed instructions on how to do binding like this you can see my previous tutorial here. Now it's time to add the button and the button loop! Make a tube using leftover knit material. I used the same width as I used to make the binding in the center back. 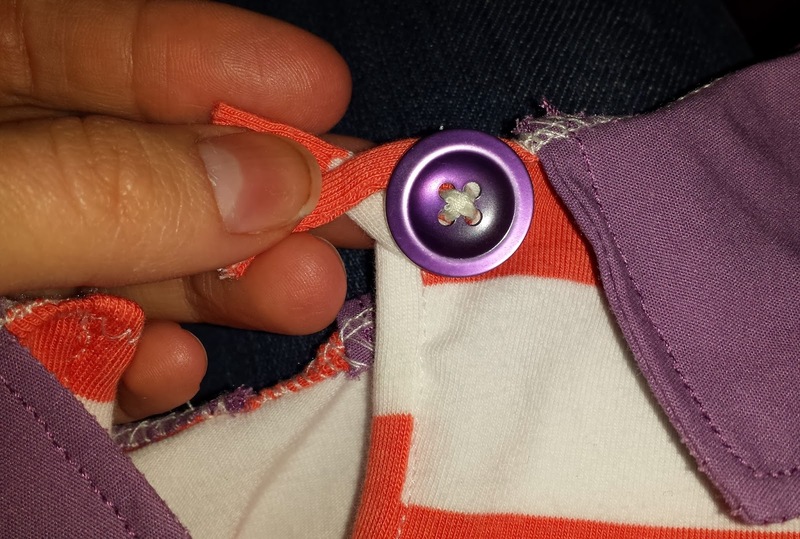 Wrap it around your button, criss cross the ends, and line it up with the top edge of the other side of the opening. 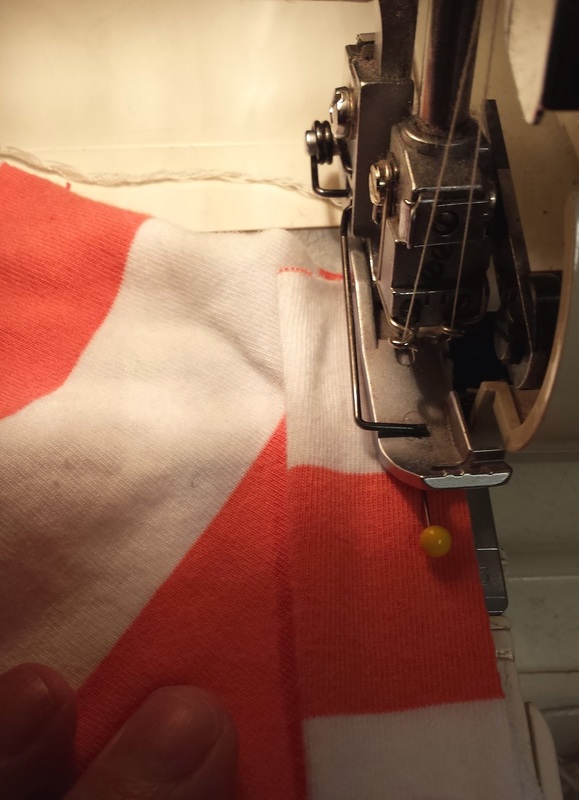 Pin it in place and sew it down! The last thing I did before sewing up the side seams of the dress was to stitch down the collar along the neckline. I did this because I didn't do a lining for the bodice of the dress to hold the collar in place properly. Finally I sewed the side seams of the bodice together, attached the skirt (which I had appliqued some flowers onto), and hemmed the skirt with my serger using white thread to make a fun contrast along the bottom. I then made a sash using some pink. I added a flower to the side of the sash using the center circle I had cut out of the skirt and another circle cut out of the pink. I did not sew the sash onto the dress so that it would be easier to get the dress off and on. It had started sprinkling so of course she tried to catch some raindrops on her tongue! Thank you Jodi for letting me come over and play again!! I LOVE this pattern and can't wait to have time to make about 100 more. Plus some fun variations that I've thought of for my tweenager.